Happy WOYWW day again! Stop by Julia’s Stamping Ground for your weekly look at wonderful workdesks across the globe. I pushed on with the decorating of my mini from yesterday. 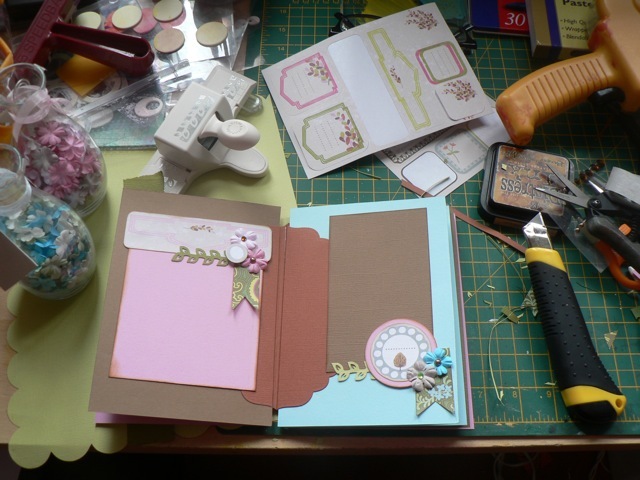 I like pre-making mini-albums, so they are ready for the re-sizing of the photos and complete in a flash. My plan for this is recording a scheduled trip at the end of the summer to take DS back to Uni up in Scotland. We are stopping over for Insomnia again (his 3-day gaming event) then carrying on to drop him off and returning. I’ll be working on it more today. 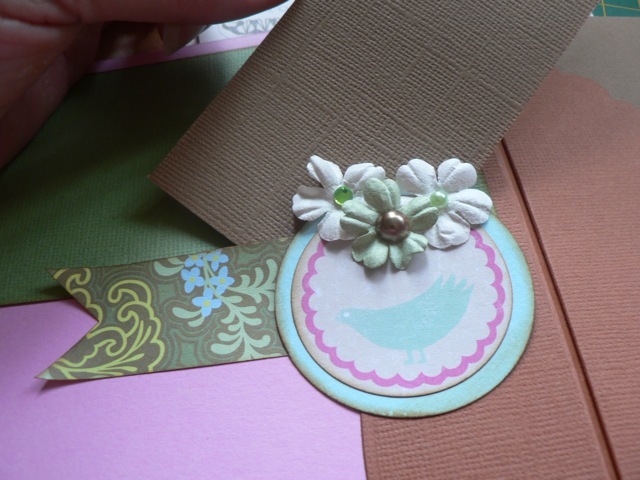 If you read back to yesterday’s post you will see that I am using a box of SUKIE labels for the embellishments and the colours echo the colours of the labels. I have one little scrap of a 6×6 piece of patterned paper that has some of the same colours so am suing that to add a little flag. The trip will include some walks and garden visits so I think the decor will be appropriate. I am planning on using the Nestie Grand label shapes that form the spine of the book (the rusty brown) for my journaling and the “empty areas” on each page for smaller un-matted photos. I’m thinking I will print them and cut them with a thin white border. A couple of things worth mentioning. 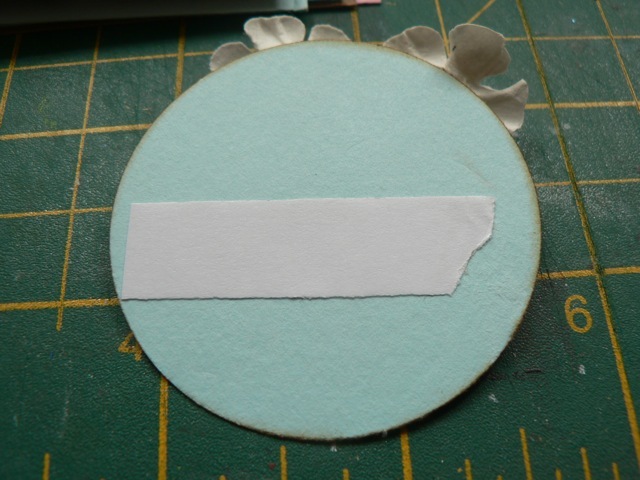 First, when pre-making a mini, if you embellish OVER the photo mat, as I have done, it’s best to adhere the bits and bobs only on the half that is outside the perimeters of the mat. Placing your adhesive that way lets you slip the photo under the embellishment at a later date without having to pry them up off the mat. I actually added a bit more adhesive to the bottom edge after I took the photo. But see how you can slip something under? 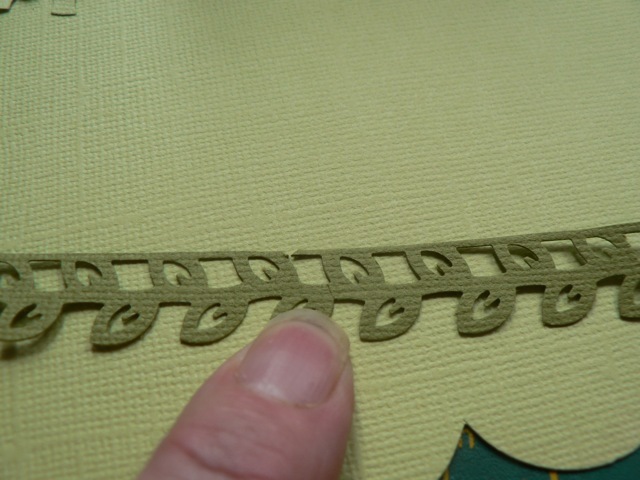 And a nifty little trick with the Martha Stewart leafy border. I punched it as normal. 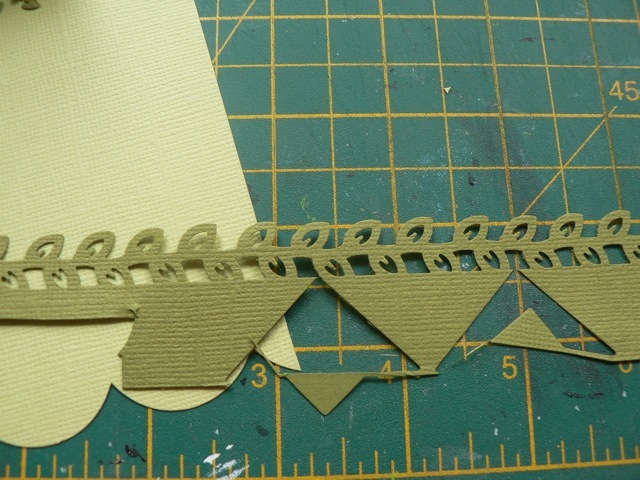 I’m using scraps so forgive the extreme wonkiness of the sample. 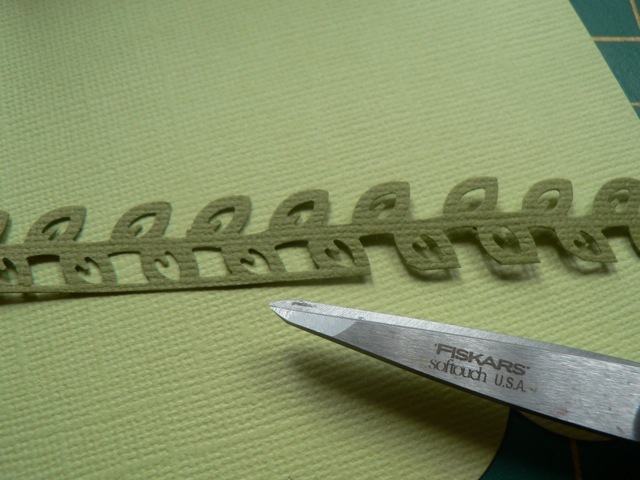 Now trim the non-border edge right close to the leaf shapes. Snip and shape the leaf to get this! It really takes only the tiniest snip and moments. But then I don’t mind this sort of scissor-work, Like hand cutting letters it’s actually much more relaxing to do than the doodling, at least for me. Categories: mini-albums, WOYWW | Tags: how-to, mini-albums, WOYWW | Permalink.